For heating rooms of small to medium size one of the efficient ways is using oil filled space heater. These units are permanently filled with thermal oil and in operation they radiate heat. There are different options available with low and high wattage, options more suitable for bigger or smaller areas. The oil in these space heaters never burns, so it never needs to be replaced. They operate on the principal of convection. The warm air produced by the heater moves upwards. That forces the cold air down, which in turn gets heated to a warmer temperature. The benefits of oil filled heaters are their economical, quiet and safe operation, as they have no fan and the heating elements are entirely enclosed inside the unit. Below we have compiled best oil filled heater reviews of the top rated and most popular models on the market. 3 How Do Oil Filled Heaters Work? 4 Are Oil Filled Heaters Energy Efficient? 5 Are Oil Filled Heaters Safe? 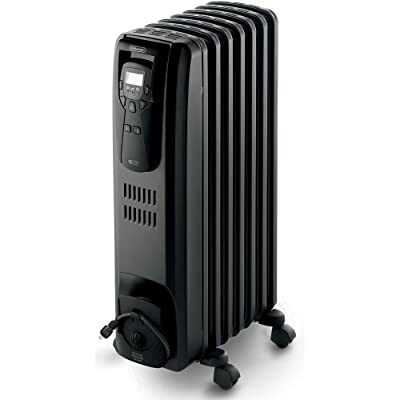 The most popular and best reviewed among the best oil filled heaters is the DeLonghi TRD0715T. It’s designed with vertical thermal tunnels for the purpose of maximizing radiant heat flow and at the same time maintaining low temperature of the surface. The oil filled radiator is permanently sealed and is filled with pure diathermic oil. DeLonghi TRD0715T features simple controls that allow adjusting the temperature. There are 3 temperature settings, but also an adjustable thermostat. You can also schedule the operation of the heater using the 24-hour timer. The anti-freeze option of the heater prevents frozen pipes by automatically turning on if the temperature goes down below 42 degrees. TRD0715T is also designed with a feature for overheating protection with automatic thermal cutoff. It’s safe for homes with children and pets. The exterior of the unit does not become hot and stays cool to the touch. 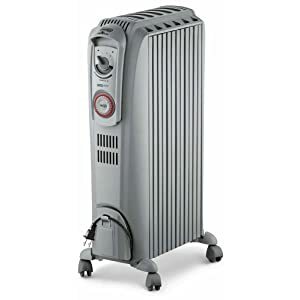 Our second best oil heater review is also of a unit of the same DeLonghi brand, which is the most popular and best rated among the oil filled type of space heaters. DeLonghi EW7707CM also uses 1500 watts and provides fast and silent heating of a home or office. It features 7 permanently sealed fins with oil inside. It offers a range of settings that allow you to customize the heating to your preference. The heater features 3 heat settings, adjustable thermostat and a ComforTemp setting. ComforTemp is an energy saving mode that will maintain the room temperature at 68 to 70 degrees. To protect the heater, there are anti-freeze and thermal cutoff features, automatically turns the unit on when the room temperature is below 44 degrees or cuts it off when it starts to overheat. EW7707CM surface maintains a low temperature and stays safe to the touch. DeLonghi EW7507EB features digital controls, using which you can adjust the thermostat or set on the three heating modes. Additionally, it has a temperature management setting that automatically cycles between heating levels and maintains a set temperature. This setting can be used to save energy. One of the benefits of the EW7507EB is its double function timer. It allows you to set two timers at once within 24 hours. So you can set it for morning and night, without having to adjust it manually. The heater’s protection system includes anti-freeze and overheating thermal cutoff. DeLonghi TRN0812T is another one of the good options for energy saving heating. It features an energy saving timer that has 96 settings and allows you operate the unit only when it’s needed and set it to certain time periods throughout the day. It comes with all the standard safety features like mentioned in the previous DeLonghi oil filled radiator heater reviews above. It prevents freezing of the pipes, overheating, stays cool to the touch and is built with a rust-resistant metal construction. The TRN0812T is also safe for use in bathrooms and other humid areas. It features a convenient GFI plug. With the 3 settings and thermostat that is adjustable to your heating needs, you can have the most comfortable room temperature. Optimus H-6010 also features permanently sealed diathermic oil that like with all the other oil filled radiators does not require refilling. The permanent sealing also prevents any leaks. It offers efficient heating that can be adjusted to the preference of the user. You can either use the 3 settings or the automatic thermostat. The 3 heat settings range from 600 to 1500 watts of power. The solid construction is made from heavy gauge sheet metal cabinet. When the company was designing this product, then kept safety in mind. For safe use it’s designed with a tip-over automatic shut off. For conveniently moving it around, it features a wheel base and a carrying handle. When the unit is not in use, the cord can be hidden away in the convenient built-in storage. It makes it easier to move the heater around and store it. How Do Oil Filled Heaters Work? 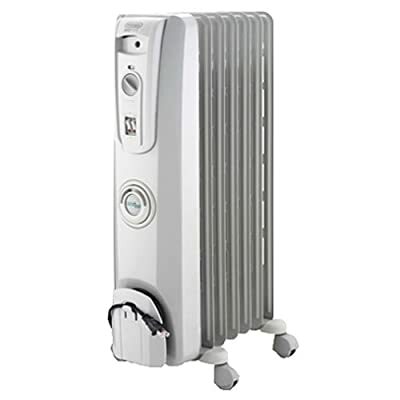 Oil filled heaters is a type of electric space heaters. They consist of metal columns that have cavities through which flows the oil around the heater. The heating element is placed at the base of the heater. This heating element heats up the oil and then the heater uses convection to send the oil flowing through the cavities. Oil has quite high specific heat capacity and high boiling point, which allows it to act as the heat reservoir. The heat from the oil is then transferred to the metal walls of the heater through convection. Then it uses conduction to transfer the heat through the walls, and finally convection and radiation to transfer it to the surroundings. Are Oil Filled Heaters Energy Efficient? 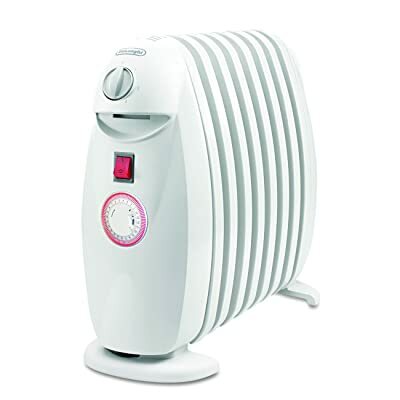 Oil filled heaters are suitable for use in bedrooms and other rooms of small to medium size. So in comparison to gas heaters, for example, the area they are capable of heating is smaller. However, gas heaters cannot be used in confined spaces. So they are not suitable for bedrooms. Many of the oil filled radiators come with a thermostat that is used to keep the temperature in the room above a certain point. The thermostat helps prevent inefficient heating, and thus reducing running costs. The power consumption for most oil filled heaters available on the market today ranges from 300 to 2400 watts. Usually, the length of the heater is proportional to its power rating. To have maximum efficiency from your oil filled heater choose the right size of the unit. 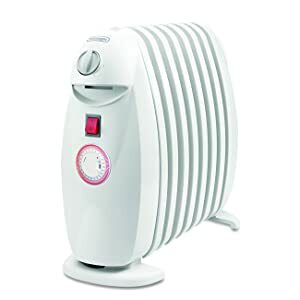 Are Oil Filled Heaters Safe? Oil filled heaters are some of the safest type of heaters. They come fully sealed so you wont to worry about any oil leaking. It does not involve burning of any oil fuel, so you wont need to change any oil. Compared to some of the other types of heaters the surface temperature is lower. On most of the modern oil filled radiators you will find a safety feature that cuts the power if the unit gets knocked over or if you place it on an uneven surface. This greatly reduces the risk of fire. Some oil heaters are not recommended for use in damp areas, such as bathrooms. The moisture can damage the components of the heater. Its also not recommended to dry clothes by placing them on the heater. Environmentally friendly. They are extremely efficient in terms of energy saving. Use low wattage. Most of the oil filled heaters are low wattage units that use minimum electricity, but generate maximum heat. Portable. On many of the models you will find an integrated wheel base and they are also lightweight enough to be able to easily move it around even with one hand. A traditional unit can weigh around 20 pounds, while the flat panel types weigh just around 10 pounds. Safe. One of the safest type of space heater. Along with the design that makes safe operation, they are also equipped with safety features such tilt over protection. Pet friendly. Because the surface doesnt get extremely hot to the touch, so if your pet brushes against it you wont have to worry about it getting burns. Silent convection heating. This type of space heaters uses convection technology to heat up the room. Its a natural method of heat transfer, so it does the heat distribution without the use of any fan or motor. This gives silent operation of the heater, which makes it great for use in many applications that require a quite atmosphere. Space saving. You can choose a flat paneled heater for extra space saving as they barely take up any space. An oil filled heater can be a good energy saving option to warm up a room at home or office. Looking for the best oil filled heater, check for safety features. Among the ones available on the market, the DeLonghi oil filled radiator heaters are some of the most popular and best rated. They have great heating and efficiency, and good safety features. 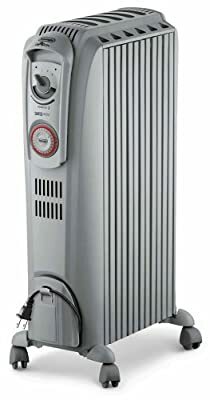 Most of the users’ oil filled heater reviews we have researched of the DeLonghi show that the users are enjoying the warmth they get with them and their quality.